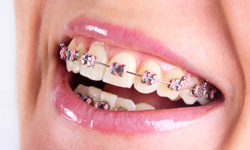 The most common types of braces are traditional metal braces. Their made of a high-grade stainless steel. 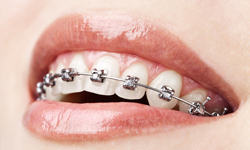 Teeth are straightened using metal brackets and arch wires which are more comfortable then they were in the past. When using metal braces, there’s the option of adding colourful elastic rubber bands to give your own flare to your smile! In our office, we use self-ligating braces. They are also made of high-grade stainless steel, however they do not require using elastics to keep the wire in place. Self-ligating braces use a specialized clip (which we call a door) to keep the arch wire in place to guide the teeth in their desired direction. Therefore, you will have fewer adjustment appointments and less agitation being placed on the tooth. Ceramic braces are clear brackets made of clear materials which equals less visible brackets on your teeth. Our office uses clear brackets on only the top teeth as they are larger and more brittle then their metal counterparts. Usually, teenagers and adult patients prefer clear ceramic brackets due to cosmetic reasons, but require more attention to oral hygiene! 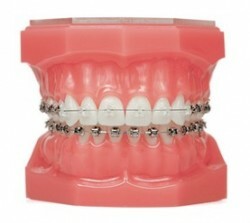 Clear lingers are a sequence of removable clear trays that correct the position of your teeth in the most discrete way. Since the transparent comfortable trays are removable, eating, brushing and flossing are no longer a worry!